Napoleon's Last Gamble contains five battle games, a 3-day campaign and a 1-day mini campaign. On June 12th, Napoleon left Paris and joined his Army at Avesnes. On the 15th, the French Army was unleashed across the Sambre River. At the first encounter Allied screening forces sent out the warning to their respective headquarters, and fell back. Can the armies of Wellington and Blucher be kept separated and defeated in detail? Or will they turn the tables on the Emperor and unite on the battlefield in front of Brussels? 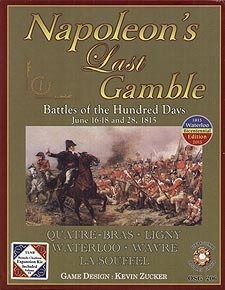 Napoleon's Last Gamble is a good game for beginners and the most demanding grognards. It incorporates the fog of war through hidden movement and vedettes. Excellent Replayability: Each playing will be different depending on the play of cards. This is a Card Assisted (not card-driven) game. The Library of Napoleonic Battles is a two-player simulation of 70 battles at the Grand Tactical level, covering all the major battles of Napoleon in 18 volumes - using one and the same rules folder that will not be redesigned along the way. Learn it once and then just focus on the unique situation presented by each battle. This box contains five complete battle games in The Library of Napoleonic Battles. The French attacked on two fronts simultaneously. The tenacious defence of Quatre-Bras by the Anglo-Allied troops saved the Prussians from receiving the full weight of the Armee du Nord. Napoleon separated the two wings of his army, ordering Marshal Grouchy on the track of the Prussians while he pursued Wellington. Grouchy's prescribed route was wide of the mark, and took him to the outer flank, allowing the Prussians to interpose themselves between the two French wings. Blucher achieved a strategic reversal of the opening. Three days after Waterloo, Rapp woke up and began a slow withdrawal from the Rhine, pursued by the vanguard of Schwarzenberg's Army. On June 26 the heavily-outnumbered Rapp skirmished with the Austrian III Corps. Two days late he made a stand along the Souffel River, and the Austrians attacked.